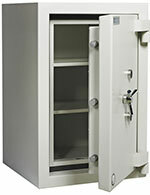 Dudley Europa Grade 4 safes designed & manufactured in the UK ISO 9001:2008. Safes offer a very high level of security with added fire protection. Secured by 32mm 4 way locking bolts. Hardened Plates and glass plates protect vital locking areas. Multiple 'Anti Explosive' re-locking devices to secure the door in case of attack. Dual EN1300 Class B certified key lock as standard (2 keys per lock). Dual base fixing points as standard.